Back when Willis Terrett was barely a teenager the enterprising youth had cornered the car washing market in his Maryland neighborhood. For $1.50 each he kept the cars of his neighbors sparkling clean. Of all the neighbors cars the one that captured his attention and the one he spent the most time on was a two tone 1955 DeSoto Sportsman. Childhood memories faded and 50 years later Terrett was flying to visit relatives in California. In order to pass the time on the airplane he took along a magazine devoted to antique automobiles. In the magazine he saw advertised for sale near Palm Springs a twin to the 1955 DeSoto that he used to wash.
Once on the California ground Terrett went to see the Emberglo and Snowshoe white two-door hardtop DeSoto. He was amazed to see the well-worn car was virtually identical to the former neighbor's DeSoto. A few parts were missing but basically, the car was intact. It had been driven 58,200 miles. He bought it in July 2007. He arranged to have his DeSoto Sportsman hardtop coupe trucked to his Millersville, Md., home and flew home to await delivery in August. Finally, the 3,890-pound DeSoto arrived and rolled off the delivery truck on it's 7.60x15-inch Goodyear tires. Those tires support the car on a 126-inch wheelbase which delivers a comfortable ride. 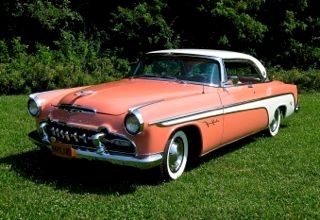 Records indicate that 10,213 such DeSoto models were manufactured, each one with a base price in 1955 of $2,939. The gear selector for the Flite control automatic transmission is a lever protruding from the “gullwing” dashboard in a vertical slot. From the top the gears are Reverse – Neutral – Drive – Low. There is no designated parking gear. That's a task for the hand brake. A 360-degree chrome horn ring makes it easy for the driver to urge other drivers to clear a path through traffic. Occupants of the DeSoto are kept comfortable via the air flowing through the cowl vent. – and pleased – that all of the glass in his car is original with no apparent delamination even in the wraparound windshield. Under the expansive hood lies a 291-cubic-inch Hemi V-8 engine that delivers 200 horsepower, sufficient to push the speedometer needle up to the 120 mph mark. This DeSoto, just like the one in Terrett's old neighborhood, is equipped with power steering, power brakes, AM radio and a clock. This car did not have a heater when it left the Chrysler Corporation factory. “It has one now,” Terrett exclaims. The chrome plated seven-tooth grille is original but the owner says both bumpers have been replaced with new ones. Chrome and/or stainless steel trim abound on the DeSoto, even atop the front fenders. Terrett has all of the bright work on his car polished to a better-than-new shine. 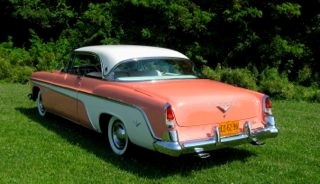 He also had the two-tone paint scheme reproduced in the original colors. Reupholstering the interior was made difficult because of the lack of availability in original colors and patterns in original material. Perseverance was rewarded, the fabric duplicates were located and the sumptuous interior now appears as inviting as it once did in 1955. Once the DeSoto was returned to like-new condition Terrett tried it on for size. When he settled into the driver's seat he noticed blind spots to the rear. He rectified the problem with a pair of exterior mirrors that clamp over the door trim so he did not have to drill holes in the freshly painted car. “I've only driven the car 150 miles in seven years,” Terrett says. The remainder of the time the DeSoto has been undergoing restoration. So far Terrett has managed to resist the understandable urge to get some water and a chamois and begin washing the DeSoto. This time it wouldn't be his neighbor's, it would be his.